When fighting game players aren’t devising new ways to squeeze extra damage out of their combos or crafting deadly setups to trap opponents, they’re usually figuring out how to defeat fellow competitors in the most stylish ways possible. 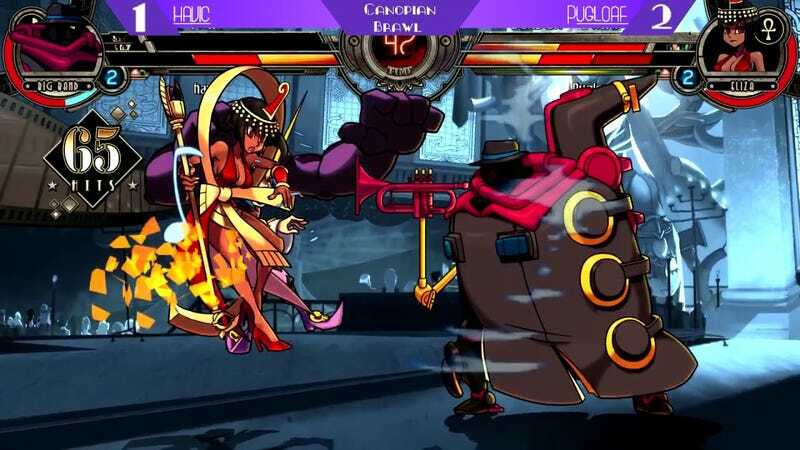 Skullgirls makes that a little easier thanks to a character named Big Band, who can utilize his musical moveset to bust out some sweet tunes in the right circumstances, and a recent tournament showed how amazing these skills can be in the right hands. Canopian Brawl is an online Skullgirls tournament nearing 20 installments. Its latest took place last Friday, pulling together a small group of dedicated players hoping to test their skills against like-minded competitors. One of these players, Havic, took advantage of a situation in a second round match to rub salt in the wounds of their opponent, Pugloaf. First, Havic landed a “happy birthday,” a situation in which two characters (typically a point character and an assist in games like Marvel vs. Capcom, Skullgirls, and more) are caught in the same combo. Then Havic activated Big Band’s Satchmo Solo super, which freezes the screen and allows the bulky detective to safely play a few notes on his trumpet. This wasn’t just a random collection of toots, however, but an apt tune for the ongoing proceedings. Did you catch that? Here, let me mess with the audio a bit. Yep, what you’re hearing is the generic “Happy Birthday to You” song belted out by family and friends across planet Earth since it was published in 1893. Havic not only had the wherewithal to land a combo on two characters to close out the match, but also knew which button combinations were needed to play one of the most recognizable songs on the planet. That said, those familiar with Havic might not have been as surprised. From the looks of their YouTube channel, it appears as if Havic been working on mid-combo trumpeting since at least December 2016. Despite coming in second place when the tournament concluded, we’d say this fantastic display definitely earns Havic an award for Most Stylish.